Since its release in 2004, World of Warcraft (WoW) claims the spot as the top-grossing MMORPG (massively multiplayer online role playing game for those that don’t know the acronyms) despite the recent hate on their latest expansion, Cataclysm. I picked up the game about 7 years ago and stopped playing for various reasons, the main one being that it was too hard finding where I needed to go questing and what I needed to kill to get particular items. I got up to around level 30 and then stopped. I haven’t picked it up again until now. In all honesty, the main reason I picked it up again was because my boyfriend played the game and just watching some one play WoW is really pretty boring. The questing design in all of the different areas follows the same formula – you either collect stuff, destroy stuff, kill stuff or kill and collect stuff. On top of that the fighting isn’t really that interesting. You pretty much click the same buttons and do various attacks, but it’s not like you can actually target a specific body part like in the Conan MMO. Still, the game is something that we can share together and play together, which is what I really wanted. And by jove, is playing the game with another person a lot of fun. Aside from being right next to each other and being able to discuss strategy, etc. we can also just crack jokes the entire time that we’re playing whether its about other players or certain questlines. Heck, we make up our own dialogue for our characters and how they would react to certain situations. On top of that, the wait for instances is practically nonexistent for a healer and a tank. WoW has also improved a LOT since I first picked up the game and the enemies that need to be killed for whatever reason are marked in red letters. And to make matters easier, the areas where these monsters are found are highlighted on the map! There are also some quests that, once completed, you don’t have to run back to the quest giver to turn in. Instead, there’s some kind of radio transmission that allows you to turn in while you are still killing stuff and even pick up the next quest along the chain. I remember, back in the day, when I had to run back each time to the quest givers up hill…in the snow. But I would be remiss in not stating the other reason why I wanted to get back into WoW and that is because of the lore. My boyfriend is a huge lorehead (his previous main earned the Loremaster Achievement) and just having him explain the back story of each area, of what happened during cataclysm and even of how things like gnomes came to be, really got me excited. I even read the Arthas book which gave more insight into the character of the current Lich King as well as characters like Jaina, Thrall and Sylvanas. 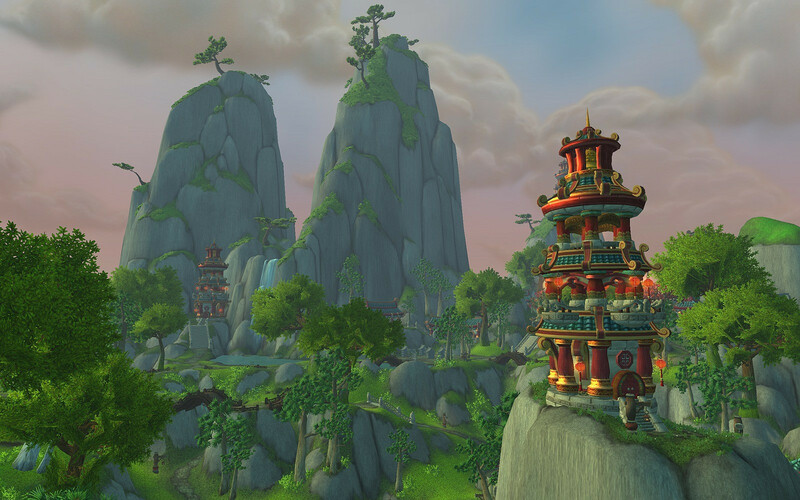 What WoW has done that many other MMOs were not able to do is build an amazing world and story. I’ve played Rift which was supposed to be on par with WoW, but the background just wasn’t there, and on top of that having random rifts open up on the starting levels was really annoying. I’ve played Ragnarok, which was cute to play but hard to really find any quests and it ended up just being a typical run around and kill stuff game with no real point. The story of WoW captivated me, and it’s a little unfair to compare something like WoW and a game like Rift that just game out. WoW builds upon all the previous Warcraft games so there’s already a very strong story foundation, unlike something like Rift. On top of that, despite the serious overtones of the game, there’s plenty of humor sprinkled around that keeps the game fun. After about a couple months of leveling on the weekends, I’m now up to level 82. While Cataclysm reused a lot of the same monsters and scenery, the world itself is really quite stunning. Almost each environment offers something new and interesting to look at and yes, to kill. Sure enemies might just be a different color, but when playing with some one else, you can always make fun of the laziness of the developers. Plus, I won’t get too bored with the game once the new expansion hits, hopefully sometime this summer. Like everyone else, I am definitely going to start a Pandarian toon and we’ll see where that story leads me. Until then, I’ll be playing with my counterpart, Happyellen.